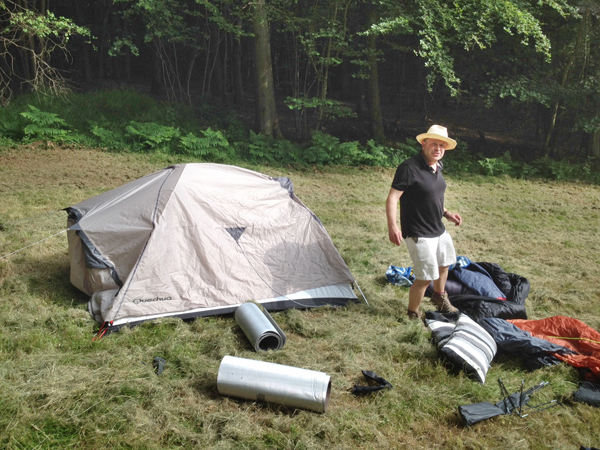 For any camping expedition, it is important to locate a camping area - we found a grassy glade surrounded by beech trees. Next, you need to find a good spot on which to pitch your tent - ground that initially seems flat is, by the end of the first night, clearly very 'slopy'! Like most people, we probably put up our tents too soon, almost immediately after we arrived, while we were all hungry and still recovering from a long car journey. 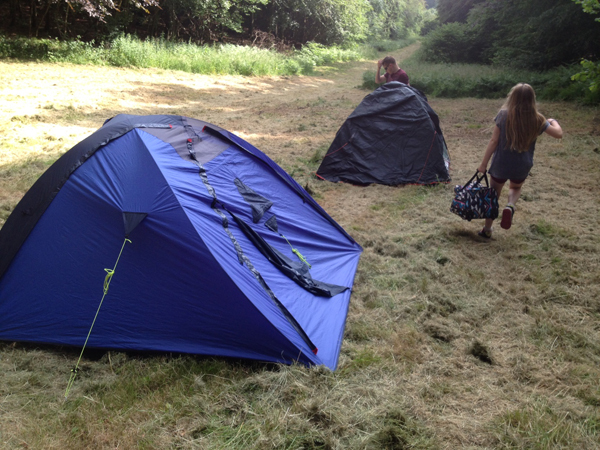 We took a while to work out how to fit together the various pieces of the tent. Thinking we were finished and standing back to admire our handiwork, we noticed that the poles were meant to go inside rather than outside the tent. Resignedly we took it apart again and put it up properly - but not without some recriminations from the teenagers. Definitely time to turn our attention to a campfire. We established the fireplace at the edge of the clearing and were able to use old bricks to support a grille for pans and a kettle. Finding suitable firewood was a challenge and the teenagers soon discovered that the pile of cut branches burnt with more smoke than fire, whereas the dead twigs on the forest floor burnt quite easily and burnt very hot. Things were now looking up even though the kettle boiled too slowly and the sausages cooked too fast. A commercial campsite will have a toilet block which almost always seems to be a long hike from where your tent is pitched - or if it is next to you it usually 'pongs' and attracts a constant stream of dazed-looking visitors, going right past your tent. Here, in the woodland, we had no such company and no such comfort, so we set about digging a loo. We put a plastic box over the hole and cut a circle in the box so that we had a workable WC (but without the water). We left a spade next to it in order to put back some of the dug earth when needed and we put a loo roll on a stick. The whole group then cut branches to make a screen to put around our improvised toilet. We were now starting to relax and change our pace of life from the driven, driving tempo of city life. Probably the sausages and tea had helped too. I found myself less interested in keeping an eye on the time and stopped worrying about home and work. 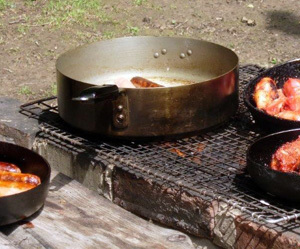 There was also nothing we could do about the many things you forget to take when you are camping - we would just enjoy those compromises that you make when camping: reusing plates as washing up was primitive, sitting on whatever logs and stones we could find, and playing football on a pitch with long grass and occasional trees. I can finally comment here again – I was judged as spam! Just to say, either “different from” or “different to” is acceptable, “different to” is a much more pleasant phrase for me. In any case, “different than” is horrible. A lovely woodland camp tale! And the dawn choral symphony – priceless ! Thanks for sharing – we’re inspired to continue our search for a little piece of woodland heavenly solace ! 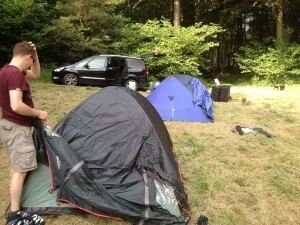 Wow, camping tips and an English Grammar lesson, although it should be ‘different from…’, not ‘different to…’ Yeeehaaa. Does this mean I’m also invited? Thanks for the article Angus, quite right! Perhaps you should take Giles with you next time and enjoy a lecture round the camp fire about Americanisms. In your first paragraph, surely it should be “Totally different to…”, not “different than” – a nasty Americanism that makes no sense. I appreciate and agree with the sentiment of the article though! Excluded from school, but not from woodlands!